In 2015, Cole and Cassie discuss Jennifer Goines and how long it will be before the 12 Monkeys break her. Cole teaches the good doctor how to shoot a gun in order to protect herself from any future encounters with the Pallid Man. Dr. Railly's mobile phone begins to ring and she soon finds herself at the local police station. Her first thought was the detective was going to question her about Cole. However, they were not interested in him, rather the cops were looking into Jennifer's disappearance from the mental institution. The detective warns Cassie that Jennifer is extremely dangerous. She hands the doctor a photograph of the scientists Jennifer stands accused of murdering. Of course, we now realize the Pallid Man was behind those deaths. The detective points out the sole survivor. Cassie looks closely and realizes she knows the man, quite well actually. The local Haitian doctor had worked an outbreak with her in 2014. Unfortunately, when she and Cole inquire about him at the CDC, they discover the doctor was killed in Haiti. Cassie felt things were hopeless, but Cole told her he could just go back in time and question the doctor before his death. She warns him to stay away from her in 2014. A meeting between the two could prove catastrophic to her future timeline. 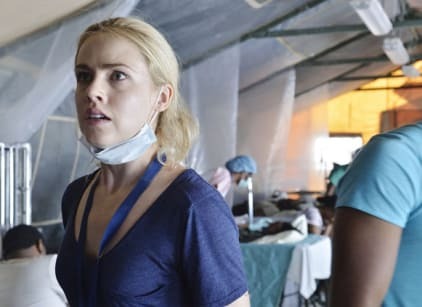 During this outbreak in 2014, Dr. Railly fought fearlessly to save lives. However, as things escalated she became irrational assuming this was the very plague Cole had warned her about the previous year. Meanwhile, Cole locates the local doctor, Henri, who eventually shares what he knows about the "Night Room." Henri tells Cole that the "Night Room" is a mobile lab. It's always on the move and scientists that work there are blindfolded in order to keep it secret. However, due to the extremely powerful viruses being experimented with, a "big burn" contamination protocol was in place. If Cole can trace this specialized equipment used to torch the lab in case of emergency, he should be able to locate the lab. Enter the Pallid Man, who finally tracked Henri down attempting to finish their conversation about the "Night Room." The old man does not recognize Cole yet, and their scuffle results in the scar he showed Cole previously. How is it the Pallid Man is so strong? One of the side effects of the splinter injections is enhanced strength. How is it possible the man stood his own against Cole? Our time traveling hero realizes the Army of the 12 Monkeys will stop at nothing to acquire the valuable information Henri carries. He tells the Haitian doctor "you never make it off this island. You'll never make it out of here" and kills him. Upon his return to 2043, Cole informs his team he knows how to find the virus. However, a dangerous group of scavs Cole used to be aligned with are planning to attack the temporal facility. The leader, Deacon, seems very interested in seeing Cole again.